Hi Sarah, I was wondering if you are going to sell some type of bleaching/whitening agent like HQ in the near future? It's just useful as a spot treatment to lighten a pimple mark or a birth mark. We do sell Tretinoin cream which is helpful in diminishing pigmentations and spots and evens out melanin distribution in the skin by increasing the turnover rate of new skin. OTC in the pharmacy. At least the lower percentages. You can use a dermaroller to enhance the penetration of hydroquinone to the dermis but do not do it for a prolonged time. The best protocol is 3 month on, 1 month off. 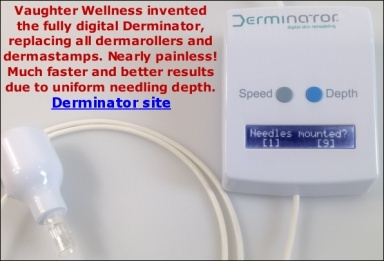 Dermarolling will greatly enhance its absorption to the deeper skin layers.